Each year the larger oil production companies provide their views of the future, and I recently reviewed that for ExxonMobil. Shell has now produced their projections, though in a somewhat different format as the document “New Lens Scenarios” which deals with future projections as a set of differing options. That does not make these views less informative. the ‘can’ keeps being ‘kicked down the road’ while leaders struggle to create some political and social breathing space. of mini-crises, which will eventually culminate in either a reset involving the writing off of sign and political capital (through pooling for example) or the euro unravelling. in their different ways, they had the financial, social, political, or resource ‘capital’ to respond and reform, following a room to Manoeuvre pathway. Within the next thirty years, as the population grows, so a greater percentage, up to 75%, will live in cities. And these will consume a greater fraction of the global energy supply, perhaps as high as 80%, up from the current 66%. The document is very much slanted as a Socio-political forecast, with considerable polemic in regard to the weaknesses that the company perceives to exist in the West. Shell postulate two different scenarios for the future. There is the Mountain scenario, where business continues very much as usual, and then there is an Oceans scenario where the” powers that are” work toward a more accommodative approach to those in the developing world, and the less fortunate layers of society. In the US, for example, income and wealth inequality continue to increase, with stagnating middle-class earnings, reduced social mobility, and an allegedly meritocratic higher education system, generously supported by tax exemptions, whose main beneficiaries are the children of the successful. superimposed on this class divide is an increasingly serious intergenerational divide, as commitments to the elderly via entitlement programmes crowd out discretionary expenditures that could rebuild economic and social infrastructure. Similarly, in Europe an ageing population and commitments to high levels of entitlement, which are frequently underfunded, create a mixture of social and political strains that deflect attention from the core structural economic issues facing the region. Driven by this gloomy picture of the future Shell anticipate that global GDP growth through the 2030’s will average under 2%. This will, in turn, moderate the growth in energy demand. Increasing urbanization, the growth of the service sector and the greater use of electricity in developing countries, Shell anticipate that the strong correlation between economic and energy demand growth will be broken. N.B. All the illustrations come from the Shell New Lens Scenarios document. Shell anticipates that hydrogen, an up and comer just a few years ago, and now largely neglected, will undergo a “phoenix-like” resurrection and find a market both in industrial and transportation as an alliance of government and private industry push a hydrogen infrastructure post-2020. 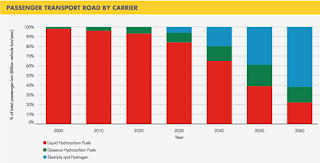 They anticipate that the use of liquid fuels for passenger road transport will peak in 2035, and that by 2070 the global passenger transportation network, using roads, could be nearly oil-free, as hydrogen and electric powered vehicles take over. Figure 2. Shell future projection of vehicular fuel sources. The energy burden will transfer from crude oil to natural gas, which will increasingly underpin the global economies, as China joins the top tier of natural gas producers. The increase in the volumes of natural gas that become available from tight shales and coalbed sources are sufficient that, by 2035 Shell anticipates that natural gas will not only displace crude oil as the primary transportation fuel, but that it will also encourage a robust pretrochemical industry based on methane. 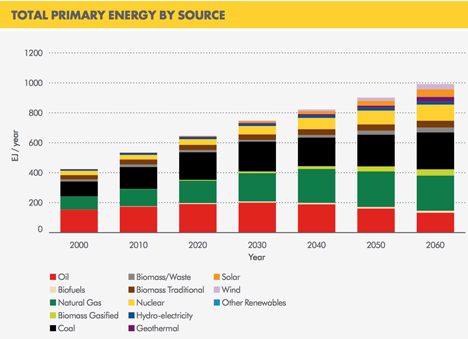 Shell sees the possibility of US energy self-sufficiency in the 2030’s as peak oil theories are abandoned. The availability and broad use of natural gas will also allow time for credible carbon capture and sequestration technology to be developed and demonstrated, so that by the time that coal is needed as a fuel (around 2075) it will be usable while sustaining the zero-carbon dioxide levels for electricity generation that become widespread by 2060. In the alternative Oceans scenario, the more accommodative approach, Shell looks to a willingness to share technology and compromise on issues of ownership and profit as a way of encouraging globalization and developing productivity. Societal interconnectivity is encouraged by greater use of the Web, and this leads to significant changes, with existing leaderships yielding to allow a broadening of governance and significant reform. The greater spread of information and connectivity makes for the more fluid nature of geopolitics that names the scenario, as increasing populism is both a source of innovation and a challenge to stability. Populism is seen as a challenge to US dominance, and is considered likely to cause “destructive and violent reactions” as globalization progresses. This progress is seen as most likely to through technological interconnection between entities that creates a new class of Mandarin who is less accountable to traditional masters. In this scenario Shell see the world increasingly run by more flexible, and decentralized governments “that have embraced radical pathways to economic sustainability”. And this includes both the United States and China. In this regard they quote the work of Anne-Marie Slaughter of Princeton on a New World Order. This change from the current business-as-usual (BAU) model has an impact on fuel availability and use. The encouragement of entrepreneurship is seen to significantly increase the penetration of solar power into the energy mix, while sustaining the era in which crude oil contributes beyond that of the Mountains scenario. Figure 4. Energy Sources under the Oceans scenario projected by Shell. 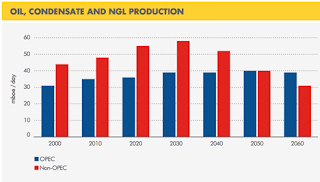 In comparison with the projections under the BAU natural gas is less of a player, though Shell don’t explain either where the additional oil will come from, or why the rush to invest in natural gas is turned off. They anticipate that the reliance on hydrocarbons will cause a rise in price that will open the door to new resources and technologies, particularly with solar power. In this future Shell sees the developing world taking more of the energy pie, yet transitioning rapidly into a lighter industrial society, with a large service component. (One wonders where the necessary heavy industry goes, as it also transitions to become 80% more efficient?) Heat pumps become a widespread domestic unit, with their benefits in energy efficiency. And, in order to sustain their market share, internal combustion engines become increasingly efficient and technically advanced. While crude oil use will increase until the 2040’s, beyond that time the increased use of biofuels will allow liquid fuel dominance to continue in vehicular use. There are two main sources for these biofuels, first generation fuels, mainly sugar based ethanol, which will contribute some 4 mbd by 2050, and second generation biofuels from non-food crops which come to dominate beyond that time. As this transition occurs so traditional biomass use will disappear by the end of the century. The different consequences of the two scenarios, as they impact fuel sources, and the unconventional nature of the Shell answers to “where will the resource come from” is shown in two plots that summarize the two energy futures. Figure 5. 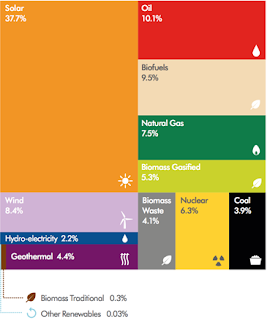 Energy sources of the future, as seen by Shell under two different scenarios – Mountains and Oceans. Under the BAU Mountain view the additional required energy will come in the natural gas side of the house, with Methane Hydrates being the major new source of fuel. With the competing Oceans scenario the energy comes from the development of kerogen from the oil shales of Colorado, Wyoming and Utah. By the end of the century renewable energy will supply more than half the electricity demand around the world, with solar carrying the greatest share of this. However they do not see the electricity generating industry becoming carbon neutral until the 2090’s, as CCS penetrates the industry. Figure 6. 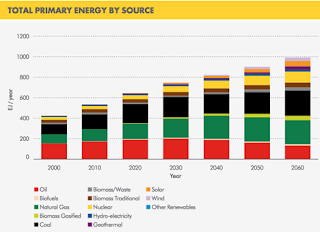 Shell’s view of electricity power sources by 2100. Shell foresee that the problems of energy storage (80% of the solar power in many OECD countries is generated in the summer) will be overcome through the use of electrolysis and the storage of the resulting hydrogen. There is much to debate over the basis on which Shell have derived the scenarios that form this report. It remains more optimistic about the oil and gas futures that I can find a basis for accepting, but nevertheless it is well worth reading as it provides two views of what might come about. The impact of societal pressures and drivers produce two different energy futures, and while I suspect that reality will be quite different, with “unknown unknowns” having great influence, the effort is worthwhile.